"Fiscal Cliff": You heard "Fiscal Cliff" during the last presidential election, you hear "Fiscal Cliff" on the news every day, you hear "Fiscal Cliff" from politicians in Washington, but do you really know what the "Fiscal Cliff" is? 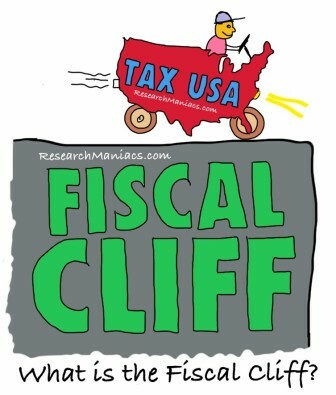 The Fiscal Cliff is referring to all the increases that are coming to the US Tax Law system on January 1, 2013 and how it will negatively affect the economy. Many believe that all of these increases to the Tax Law will substantially slow down economic growth in this country. The United States is in desperate need for economic growth, but with the new tax laws, the United States is setting itself up to hop off the Fiscal Cliff. Many think we may head into the worst economic time in generations if all of these tax increases take effect. 2-percentage point payroll tax. This is the temporary Social Security Tax decrease that will go back to the normal pre-decrease percent of 6.2. Individual Income Tax rates will go up across the board. The 10 percent tax bracket will go up to 15 percent. The 25 percent tax bracket will go up to 28 percent. The 28 percent will go up to 31 percent. The 33 percent tax bracket will go up to 36 percent. And the 35 percent tax bracket will go up to a whopping 39.6 percent. End to Alternative Minimum Tax (AMT) adjustment every year, which means that more tax payers will be paying Alternative Minimum Tax, and people who already pay AMT will pay even more AMT. Most Capital Gains Taxes will increase from 15 percent to at least 20 percent. Qualified Dividend income will increase from 15 percent to more than 40 percent. In addition, there will be a new 3.8 percent Medicare tax on trusts and estates. An end to numerous corporate tax breaks that may prevent corporations from investing and a proposed small business tax increase. In addition, the maximum expense deduction on assets for small business will go from $139,000 to only $25,000. Many of the above taxes are simply increasing because the lawmakers are letting all the tax breaks expire that were created under the Bush administration. Many have argued that simply extending these tax breaks into the future would keep the United States from hopping off the Fiscal Cliff. To further assure that the US will see the bottom of the cliff, there are also laws that will take effect to reduce the deficit by reducing spending. In conclusion, consumers will have less money to spend, corporations will have less money to invest, and the government will reduce its consumption. All this will slow down the economy to a point where it may go over the Fiscal Cliff.